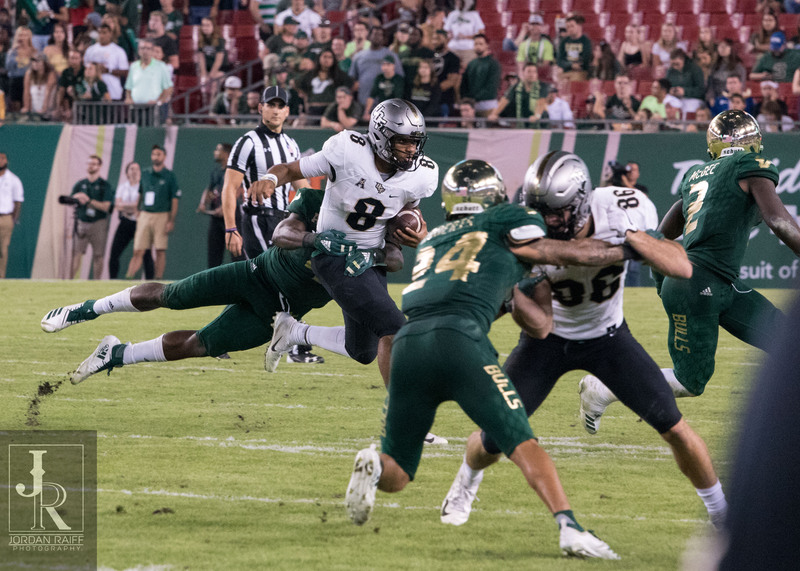 Coming off the program’s fourth straight bowl appearance, the USF football team will open its third season under head coach Charlie Strong with a primetime clash vs. Wisconsin on Friday, Aug. 30 nationally televised on an ESPN network from Raymond James Stadium. The American Athletic Conference announced the 2019 schedules for all 12 conference teams on Thursday. The clash with the Badgers, No. 17 in the CBS Sports Way-too-early Top 25 rankings for 2019, moving to Friday night of Labor Day weekend was among the highlights of a 2019 schedule that will see the Bulls play seven games in Raymond James Stadium, including five against opponents that played in bowl games last season. The Bulls’ conference slate is highlighted by three straight November home clashes with conference title contenders Temple (2018 East Division runner-up), Cincinnati (2018 East Division third place) and Memphis (back-to-back West Division winner) before the regular season finale in the War on I-4 in Orlando. Kickoff times and remaining television designations will be announced at a later date. The Bulls will open their 23rd season of football with their biggest season opener since winning on the road at No. 16 Notre Dame (23-20) to open the 2011 campaign. The Wisconsin game, which was originally slated for an Aug. 31 kick, will pit the Bulls against a Badger program coming off its 17th straight bowl appearance and returning Doak Walker Award winner Jonathan Taylor, who ran for 2,194 yards last season. Wisconsin appears in multiple preseason Top 25 polls after an 8-5 season capped by a 35-3 victory over Miami in the New Era Pinstripe Bowl. The Badgers won the first meeting with USF, 27-10, in 2014 in Madison, Wisc. USF will travel to Georgia Tech on Sat., Sept. 7 for the second meeting between the schools. The Bulls used 21 unanswered points in the fourth quarter to post a 49-38 comeback win vs. Tech in Tampa last year. The Bulls return home on Sat., Sept. 14 to face South Carolina State and get the first of two byes on the season the following week before opening conference play in Raymond James Stadium on Sat., Sept. 28 vs. SMU. The Bulls own a 3-1 record vs. the Mustangs and it will be the first meeting since a 35-27 victory in Dallas in 2016. USF will hit the road to face UConn on Sat., Oct. 5. The Bulls own an 11-5 record vs. the Huskies and have won the last seven meetings. USF will wrap up its non-conference slate vs. BYU on Sat., Oct. 12. It will be the first meeting with the Cougars, who posted a 7-6 mark and defeated Western Michigan in the Famous Idaho Potato Bowl last season. USF returns to conference action with back-to-back road games. The Bulls will travel to Navy on Sat., Oct. 19 for a game televised on CBS Sports Network and then head to ECU on Sat. Oct. 26as conference play heats up. The Bulls are 1-1 all-time vs. the Midshipmen, falling, 29-17, at Navy in 2015 and winning, 52-45, in Tampa in 2016. The Bulls are 8-1 all-time vs. ECU and have won four straight, including a 20-13 victory last year in Tampa. USF will get its second bye of the season before a strong closing slate against teams that posted a combined conference record of 26-6 last year. The Bulls will get the first three of those games at home starting with a Thurs., Nov. 7 primetime clash vs. Temple on ESPN. USF fell to 2-3 vs. the Owls after a 27-17 loss in Philadelphia last year as Temple went 7-1 in the conference and finished second in the East Division. The Bulls beat Temple, 43-7, in 2017 in a Thursday primetime clash in Raymond James Stadium. Cincinnati comes to Tampa on Sat., Nov. 16 followed by a visit by defending West Division champion Memphis on Sat., Nov. 23. The Bearcats posted an 11-2 record last season, including a 35-23 victory over USF in Cincinnati to take a 9-7 lead in the series and end a string of three straight USF wins. Memphis posted an 8-6 record last season and fell in the conference championship game for the second straight year. The Tigers lead the series with USF, 5-4, but the Bulls posted a 49-42 victory in Memphis in the last meeting in 2016. The Bulls close out the 2019 regular season with the traditional Friday clash with UCF. The 11th installment of the War on I-4 is set for Fri., Nov. 29 in Orlando and will be broadcast on an ESPN Network to be designated later. 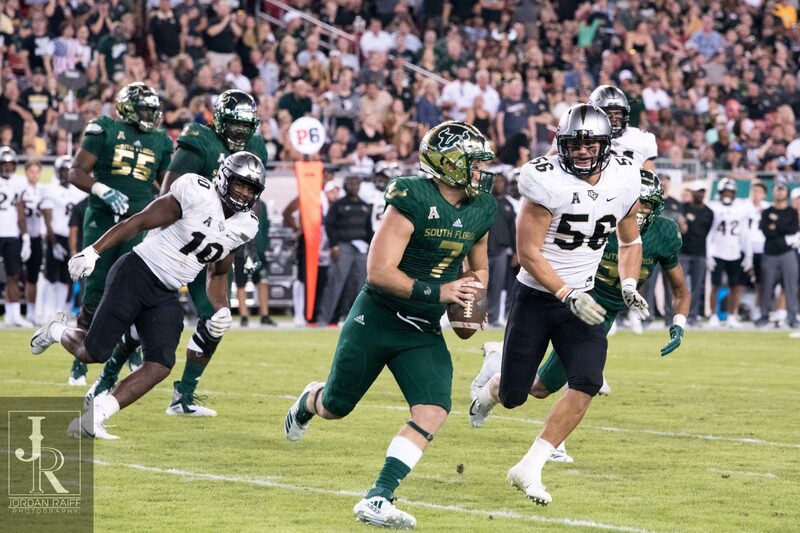 USF leads the series, 6-4, but will look to end a string of two straight wins by the Knights, who claimed a 38-10 victory in Tampa last year and won an epic 49-42 game in the last meeting in Orlando in 2017. The American Athletic Conference Football Championship Game will be played on Saturday, Dec. 7 at the home site of the division winner with the better conference record. USF football season ticket member priority renewal period ended on Feb. 6, but members can still renew their tickets for the 2019 season by visiting USFBullsTix.com by calling 1-800-Go-Bulls. Deposits for new season ticket members are currently being taken and may be made at the below link. New season tickets will be available for purchase beginning in April. 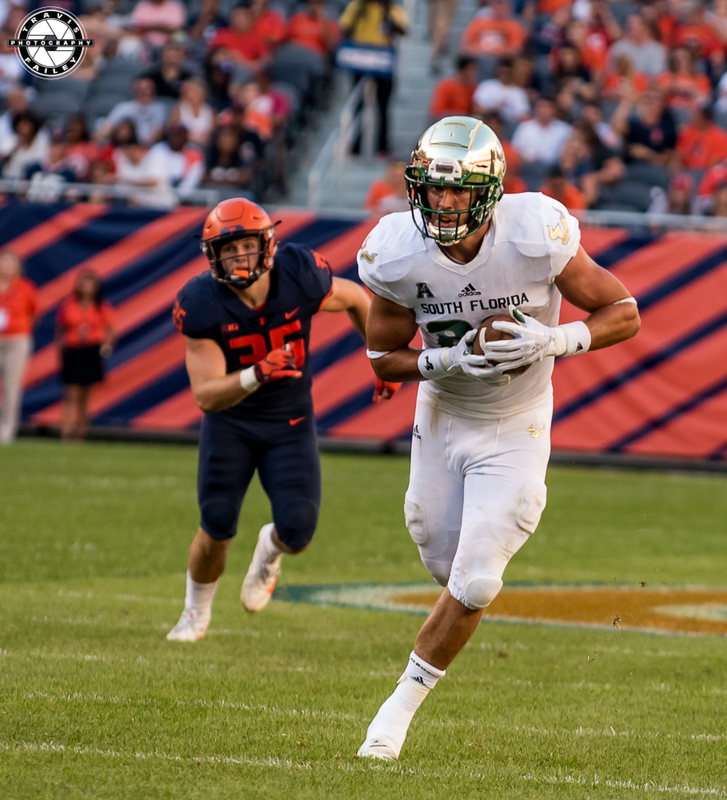 In just its 22nd season of football, and 19th at the FBS level, the USF football program has earned 10 bowl appearances, including a current run of four straight, and owns a record of 6-3 in bowl games. The Bulls have appeared in the national top 25 rankings in each of the past three seasons, including a program record run of 20 straight weeks in the top 25, and in 2018 reached the program’s 150th win faster than any FBS program in state of Florida history. USF has posted a pair of 10-plus win seasons in the last three years, including a program-record 11 wins (11-2) in 2016, and logged 15 winning seasons overall. Since first taking the field in 1997, the USF program has reached as high as No. 2 in the national rankings (2007), seen 30 players selected in the NFL Draft, 14 named All-American and 29 earn first-team all-conference selection. Follow @USFFootball on twitter for all the latest information concerning the USF Football program. Bobby Dodd Stadium, Atlanta, Ga.